A Scottish Professional Football League request for £4m in government funding for facial recognition technology at stadiums has been rejected. The Scottish Government says it is up to the governing body and individual clubs to provide the cash. "We remain committed to working with football authorities, clubs and Police Scotland to support them in tackling unacceptable behaviour," it said. "But, ultimately, the responsibility lies with the authorities and clubs." The statement followed discussions between the government, the Scottish Football Association and the SPFL. "It is clear that we would not financially support the introduction of facial recognition technology in football stadia," continued the statement. "We do, however, welcome continued engagement with the football authorities to discuss the practical action they are taking to address the continuing issue of unacceptable conduct at Scottish matches." The SPFL had set up a working group and revealed the proposal for facial recognition technology at a meeting of all 42 clubs in January. 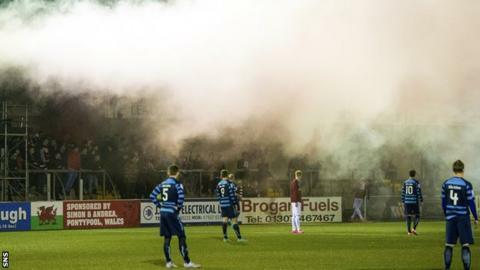 Several clubs told BBC Scotland that they believed the scheme was over the top and too expensive, but the SPFL had pursued the matter as a way of tackling recent issues with flares, smoke bombs and sectarian singing. An SPFL spokesman said: "With our colleagues at the Scottish FA, we had a positive meeting with the Scottish Government this week to discuss potential measures to help combat unacceptable conduct at Scottish football grounds, ensuring they remain safe places for people to enjoy our sport. "The SPFL's submission of tentative funding costs - specifically for technology to assist with identification of individuals engaged in unacceptable conduct - followed previous discussions with the Scottish Government where we built on quotes based on the top two divisions only. "We remain committed to tackling unacceptable conduct where it occurs in SPFL grounds - indeed, an independent commission recently found Motherwell FC guilty of breaches of SPFL rules in this area. "The overwhelming majority of Scottish football supporters behave impeccably, are the best possible ambassadors for our national sport and are a force for positive change. "We remain keen to work in partnership and on an ongoing basis with the Scottish Government and others to tackle unacceptable conduct and to use the unique power of football and of football clubs in their local communities to assist with tackling other positive changes in society, including in health, lifestyle and wellbeing."